as well as beautiful mountain and ocean vistas in the setting sun." 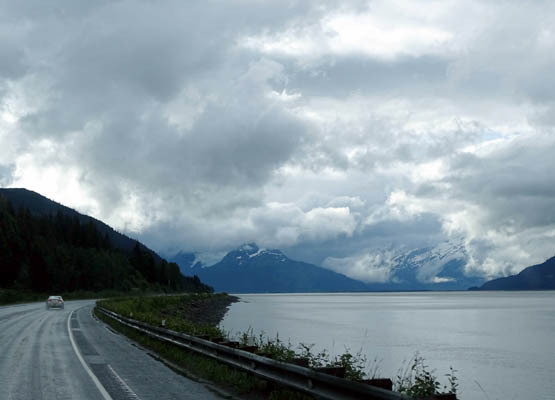 We decided to drive down to Portage Valley this morning with just the truck so Jim could check out the shoulders along the Seward Hwy. 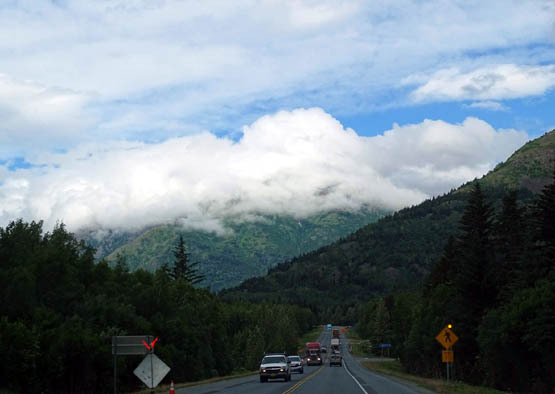 He wanted to do a long bike ride later this week from the south part of Anchorage to the visitor center past Williwaw Campground on Portage Valley Rd. but decided there's too much traffic -- and it'll get worse by Friday because of the upcoming holiday weekend. He concluded that he'll just have to continue doing long rides at JBER and on Anchorage's great network of bike paths. He's training for a 100-mile bike race in a couple weeks. 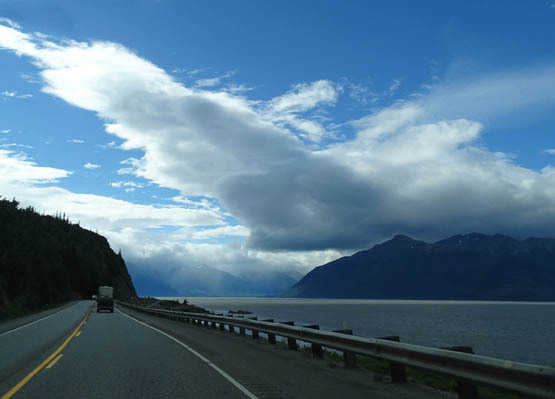 The drive along Turnagain Arm is gorgeous when the sun is out and the tide is high. This morning the tide was high but the only sun was back in Anchorage. 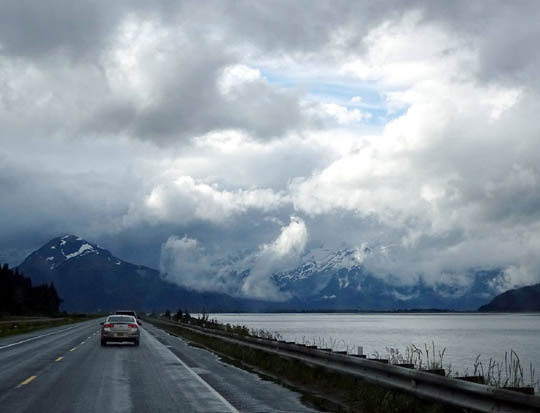 However, the clouds and rain we saw to the north (Chugach Mountains), south (more Chugach Mountains on the Kenai Peninsula), and east toward Portage Valley made for some dramatic photos. 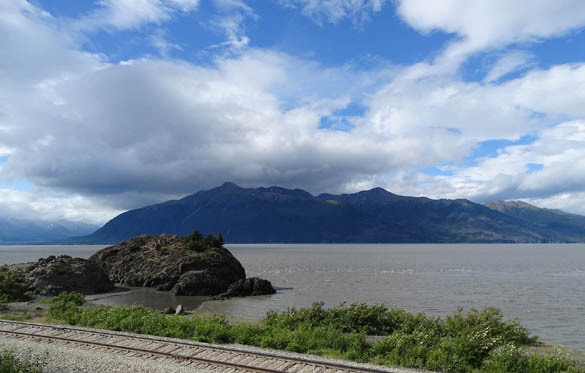 The Alaska RR track follows the highway to Portage; this is Beluga Point. The biggest problem on this road is all the traffic. Even on a rainy weekday, traffic along the narrow, curving road is pretty heavy. Weekends are worse. Tourists are totally distracted by the scenery and locals are impatient -- a recipe for wrecks, which are frequent here. 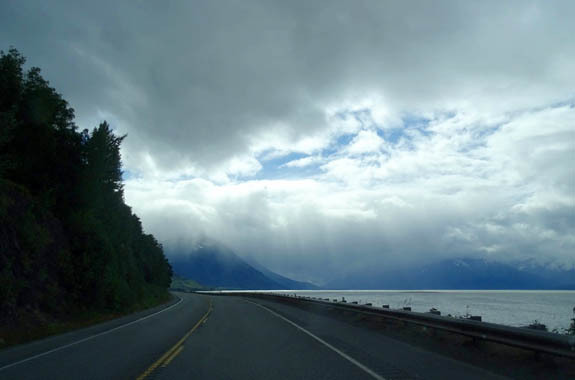 We could see rain in Portage Valley before we got there. That put the kabosh on hiking the Trail of Blue Ice or at Byron Glacier, two places we really enjoyed in 2012. 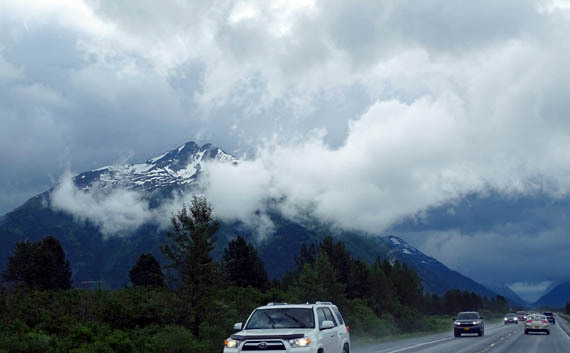 Above and below: Several glaciers in Portage Valley are visible before you get there. We spent quite a while investigating sites at Williwaw Campground. 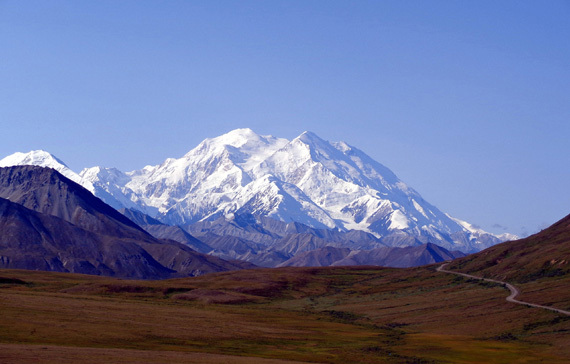 We have a reservation for a site for two days in early August before we go to Seward and for three days after Seward. We concluded that site is probably going to be too narrow and difficult for us to get in. Only about 20 of the 60 sites can be reserved. Jim wanted the security of having a site reserved so we did that online several months ago. Even though we looked at the sites on Google Earth they look different in person. We drove through the campground loops three times, noting sites that were long enough and had good access for our 36-foot 5th-wheel coach and truck. 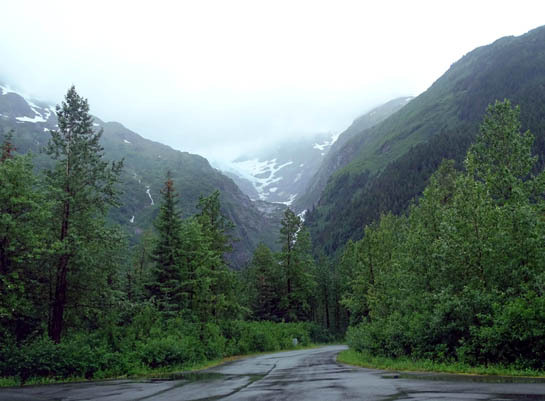 One of the hanging glaciers in the valley is visible from the campground. It costs almost as much to change a reservation as our half-price Olde Phart National Forest Service site fee so we decided to leave the reservations as is and hope to get a non-reservable site that's larger when we arrive each time. The host and his wife said the campground has had plenty of sites available on weekdays so far this summer. 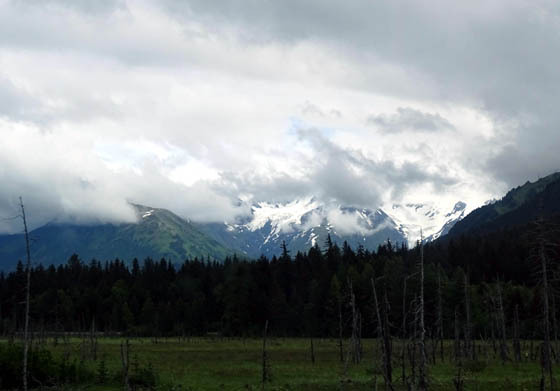 Clouds obscure most of Twentymile Glacier between Portage and Girdwood. We put off doing two other things on our list for this day trip, too. It was raining on our way back to Anchorage so we didn't drive back to the Crow Pass trailhead at Girdwood. It's several miles off the highway and we didn't know the condition of the road in the rain. We also didn't walk as planned at Potter's Marsh because dogs aren't allowed on the boardwalks or trails. We forgot about that. 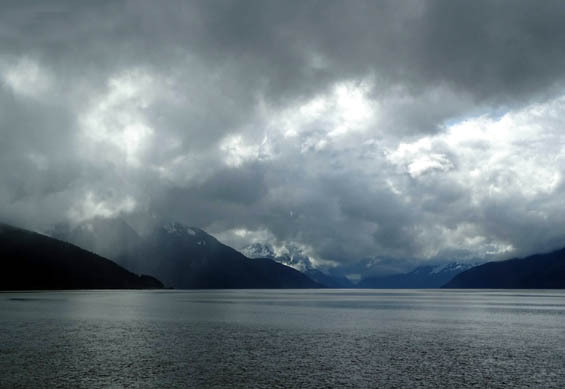 Although it sounds like this day trip was a bust, we enjoyed the dramatic scenery. It was quite different from the sunnier trips we had on this road in 2012. 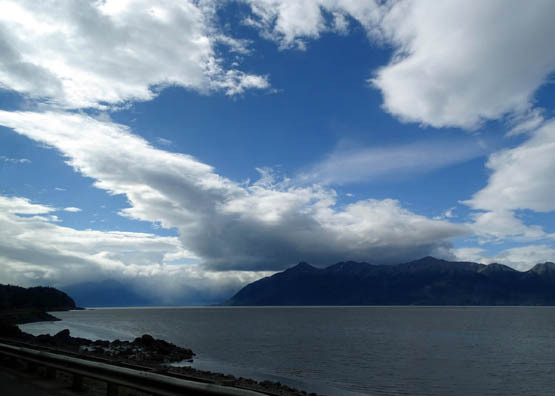 It was mostly sunny when we got back to Anchorage today at lunchtime. We did some shopping, then spent time hiking and riding our bikes in the afternoon and evening. 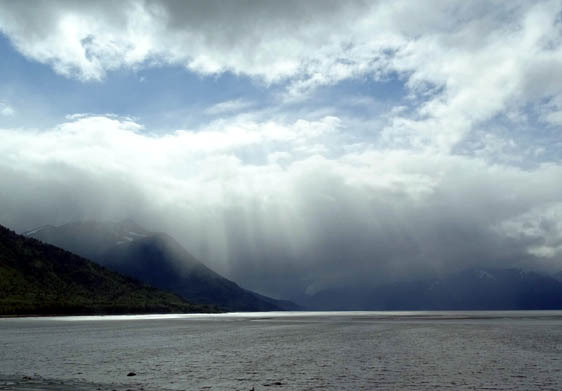 The weather can change quickly in Alaska's microclimates.